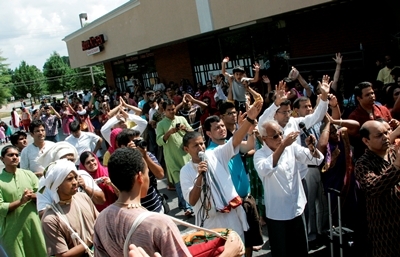 The Hanuman Mandir of Alpharetta celebrated one of the most ancient festivals in the world, Sri Jagannatha Ratha Yatra or the Chariot Festival, for the third time in a row on Saturday, June 28th, 2014. 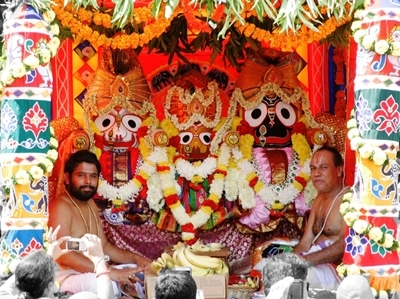 The festival has its special place in the history of Sanathana Dharma for being the only festival where the Lord of the Universe Jagannatha along with his brother Balabhadra and sister Subhadra in their original deity form (not the utsava murthi) come out of their abode and go on to the streets of the town for celebrations. Although the festival is now celebrated all over the world, the Hanuman Mandir celebrates it in a special way. Swami Adyananda Saraswathi Maharaja has been supervising the festival at Hanuman Mandir since its inception. An erudite Sadhu, he knows the entire process of Jagannath worship and Ratha Yatra as performed in the holy dhaama of Puri, India. With his guidance and the help of volunteers, the Hanuman Mandir celebrates this festival with original traditions, performing the rituals exactly as done in Puri. The festival started on June 15, 2014 with Snaana Yatra (Bathing Festival), which is celebrated on Jyeshta Purnima to the deities Jagannatha, Bhalabhadra, Subhadra, Sudarshana, and Madanmohan decorated in elephant headgear representing the Vinayaka (gaja vesha or elephant dress). Hundreds of devotees participated, with everyone getting once-a-year opportunity to perform abhishekam. The festival started with Surya Puja, Mangalarpan by praying to Surya Bhagavaan for his blessings to ensure that everything happens as planned. Later the deities are taken to Snaana Mandap (Dhadi Pahandi or group movement in a row) and several pujas are performed: Jalaadhivaasam, Kalasha Puja, Pancha Devatha Puja, Sodasopachaara Puja, and Snaanabhishekam with 108 kalashas. The lordships are then traditionally believed to fall ill and are kept in a sick room for 2 weeks. The lordships recover, and on the 28th of June resumed giving darshan to devotees in the grand procession called Ratha Yatra. On this day after performing Kalasha puja and Nrusimha Homam, the deities are carried one after the other in to the beautifully decorated ratha (chariot). This procession is called goti pahandi when the deities move one after the other in close succession. Devotees chanted loudly “Jai Jagannath,” “Jai Balabhadra,” “Jai Subhadra” as the lordships are carried with little pauses in forward and backward motions as if lending their ears to the earnest prayers of the devotees. Tens of devotees worked day and night to put the ratha together in time for this beautiful procession. Over the years Sri Bimal Mishra has improvised and engineered the chariot to make it more streamlined and maneuverable. Head priest Srimannarayana Puranam Swami was wonderful for alankaaram: deities were beautifully dressed and decorated with jewels and flowers. The chariot carrying the deities was equally decorated with flowers and garlands. Priest Laxman Acharya Swami is known for his dedication while performing the pujas and homams; he ensured that the devotees are immersed in devotion during the entire festival. Head priest of IACA temple Pundit Pramod Padhi and volunteer priest Debee Khadenga were diligently involved in assisting. Ratha Yatra started with Cheraa Pahanraa ritual where before pulling the chariots, the king of the town comes in a palanquin, offers garland, perform arathi, fans the deities with chaamaram, pays his obeisance, and sweeps the platform around the simhaasana of the chariots with a broom. Devotees enthusiastically pulled the chariot across the street and around the school opposite the temple. Devotees from the local Iskcon temple participated, performing bhajans, much to the delight of devotees—especially when Raghupathy Kishore led the bhajans from the front; devotees could not resist dancing in ecstasy and sanging with utmost devotion. The entire procession was very impressive and took the consciousness of the devotees out of this mundane world to immerse themselves in bhakti. Several volunteers helped in the preparation of sanctified food, prasadam, working from Friday until Saturday evening. The food volunteer team ensured that more than 900 devotees were fed. Kids were kept engaged with play rides and candy machines. Senior priests Sriman Rangachary Swami and the founder Sri Seshavathaaram Swami were present all the time and during the Ratha Yatra engaged the devotees and took care of the deities on the chariot.